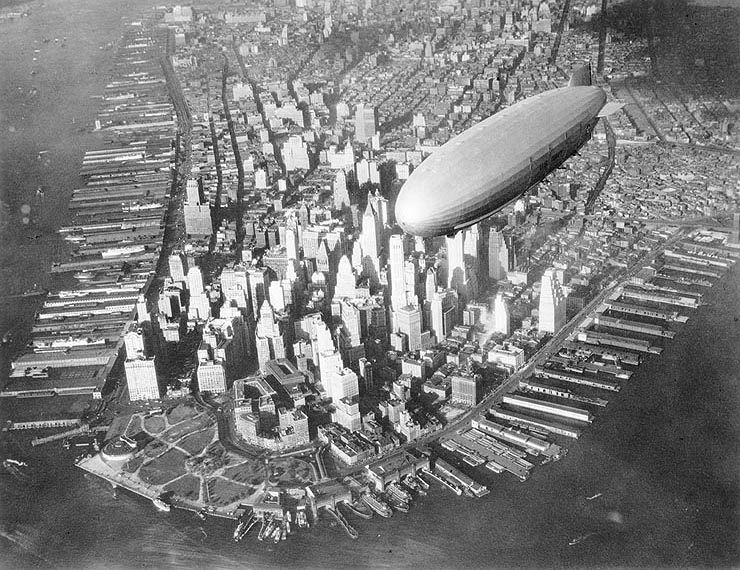 The USS Akron over Manhattan. This post was first published on my other blog, back when I thought it would make sense to discuss my academic work there. It’s a summary of a paper I wrote last year that uses a theoretical perspective called the multi-level perspective on socio-technical transitions to explain the disappearance of the passenger airship just before the Second World War. Contemporary conversations about the Hindenburg disaster tend to make heavy use of 20/20 hindsight. The engineers behind the German airship program are thought to have been short-sighted, arrogant, or stupid for using hydrogen as the buoyant gas for a passenger airship, and the crash of the Hindenburg at Lakehurst, New Jersey is thought to have been the inevitable result of such hubris. The airship is, furthermore, thought to have been a doomed technology from the start-a dangerous and unwieldy stepping stone on the way to the passenger airliner so prized today. As is almost always the case with history, the popular understanding is woefully oversimplified. The engineers who designed and built the Hindenburg were more than aware of the destructive power of hydrogen, and they went to great lengths to safely contain it. All the hydrogen in the ship was contained in gas cells made of a composite material carefully engineered to minimize gas loss and completely eliminate the risk of static electricity buildup. Every single piece of metal in the ship was wired together into an electrostatic whole, so as to the risk of ignition from sparks jumping from one metal component to another. Sparks were also reduced by conducting all intra-ship communication via speaking tube, rather than radio. The most common conclusion about the cause of the disaster is that gas escaping from a gas cell torn by a broken support wire was ignited by a spark which jumped from rainwater on the outer cover to a metal support beam-a highly unlikely occurrence which nevertheless ended the era of the passenger airship. These preparations allowed the Hindenburg and its sister-ship the Graf Zeppelin to fly an entire successful season between Rio Di Janeiro, Friedrichshafen, Germany and New York. A short-lived British airship program also had a number of successful transatlantic passenger test flights. In fact, on the eve of the Hindenburg crash, it would have seemed like airships were poised to become the transatlantic passenger carrier of choice. Somebody in the present day who did not know about the accident might wonder why they did not, as the physics of aerostatic versus aerodynamic flight, combined with the 20 year head-start on trans-atlantic capacity would mean that airship flights would be both cheaper and more comfortable than what we currently put up with on jet airliners. Of course, we all know that the long-distance passenger airship died with the Hindenburg, and has not been resurrected since. The popular historical narrative says that this is because airships were inherently dangerous and inefficient, and the brief German, British and American flirtation with them was ultimately misguided. This view largely ignores the fact that much safer helium airships had been built by that time, and for a further 20 years they retained a monopoly on the capability for nonstop transatlantic passenger trasnportation, but that they were also phased out shortly after the disaster at Lakehurst. The question to a historian of technology, then, must be why this happened. To explain the rapid disappearance of the passenger airship, I turned to a model of techno-social relations commonly known as the multi-level perspective . The multi-level perspective holds that there are three important levels to consider when thinking about the rise or fall of any important technology. The lowest level is that of the niche. Niches are small, sheltered environments where technology is allowed to develop more or less freely. They can be created by venture capital, corporate or government support, or a very driven inventor who is willing to sink his own resources into a project. The important thing to remember about technological niches is that they allow technology to develop without having to support itself in the market. All technologies must start at this stage, because it is nearly impossible to go straight from the drawing board to a device that people will be willing to pay money for. Google’s self-driving car is a good example of a technology currently in the niche stage. The second level is the socio-technical regime, which includes a complex and diverse set of factors which serve to reinforce the role of a technology in society. When technologies ascend from their early niches into the regime, they tend to entrench themselves there. A good example of this is the automobile. Its manufacturers and users have significant political clout, leading to the construction of more roads, which further encourages the use of auto mobiles. Meanwhile, cars are an important part of our cultural self-understanding, and the huge industrial capacity of the auto industry makes it difficult for alternatives to be financially competitive. The sum of these factors and many more like them means that cars are heavily entrenched part of the socio-technical regime. The third level is the landscape, and it describes the big, macro-historical influences that shape culture, economics, technology, and virtually every other human activity. The Obama administration is a part of our current socio-technical landscape, as are climate change and the baby boom. Landscape pressures will periodically exert an influence the socio-technical regime, allowing technologies residing in niches to come up and take their place. An example of this was when the Socio-technical landscape of the Second World War produced a demand for a super-weapon, allowing the niche innovation of atomic technology to move into the socio-technical regime in the form of nuclear weapons and, eventually, power plants. Those who work in technological niches are almost always trying to get their technologies into the socio-technical regime, but few new technologies are successful at this. The process of ascent into the regime demands the supplanting of any entrenched competing technology already found there. The passenger airship, initially nurtured in a protective niche provided by government funding and military applications, was lucky not to have to compete with another means of transatlantic flight for dominance, but it did still have to undertake the difficult task of gaining support from the various facets of the socio-technical regime. This is a difficult process for any technology, and it is a necessarily public process, in which the public must be persuaded to place political, financial, and cultural investment in an unfamiliar contraption. Hugo Eckener, the architect of theHindenburg, realized this and accordingly he arranged a series of promotional airship flights, many of which carried important dignitaries and one of which made a full global circumnavigation. Early indications suggested that this strategy was successful. Tickets on the Hindenburg and Graf Zeppelin were in high demand in their first season of operation, airship masts were being built all over the world, and the airship was increasingly becoming a culturally important symbol of German identity. It was not only the Hindenburg disaster that lead to the abandonment of the airship program. The British airship R101, which crashed seven years earlier due to bad weather, was the end of a similar program in Britain. What makes these events very similar is that they occurred at the crucial point when the airship was courting publicity in order to facilitate the transition from sheltered niche into the socio-technical regime. Two dramatic, tragic, and public accidents were all that was needed to bring the process to an abrupt close. There is, of course, no guarantee that we would all be flying around on airships today if theHindenburg had not crashed-the competition between airships and jet airliners after the Second World War would undoubtedly have been interesting. The point of this goes beyond passenger air transport, however. It turns out that the process by which the public adopts new technologies is an extremely sensitive one, because it subjects devices which can be very vulnerable to contingency to public scrutiny. A single wayward spark or bad navigational decision can cause a dramatic collapse of public support, and put an end to an otherwise promising technology. This has important implications for how we understand the technical choices we make. If you want to read the whole paper in its 4000 word glory, I’ve uploaded it here .